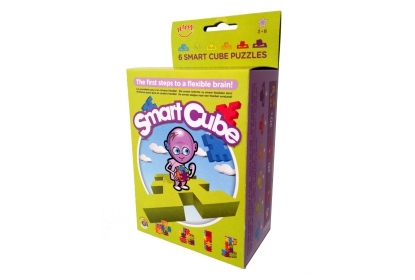 Smart Cube 6-pack: contains 6 colorful puzzles and 15 cards with 30 challenges in 4 levels! The Smart Cube 6-pack comes in a box with header with 6 different coloured puzzles, with the same shape and 15 double-sided 4-level instruction cards = total 30 challenges! The cards contain several possibilities of constructions with the puzzle pieces. There are 4 difficulty-levels: Explorer, Builder, Creator and Genius. Smart Cube is just perfect for kids from 3 to 6 years old. The simple puzzle pieces enable smooth fantasy construction building. Great for the development of spatial thinking! When they manage to make all the constructions, kids will have become real geniuses!